This data set provides atmospheric carbon dioxide, methane, carbon monoxide, molecular hydrogen, nitrous oxide, sulfur hexafluoride, and other trace gas mole fractions (i.e. "concentrations") from a flask sampling system at the CARVE flux tower in Fox, Alaska for the Carbon in Arctic Reservoirs Vulnerability Experiment (CARVE). The data were derived from laboratory measurements of whole air samples collected by a Programmable Flask Package (PFP) from the top of the tower at 32 m above ground level during late evening multiple times per month since January 2012. Whole air samples collected in the PFPs were analyzed on automated systems at the NOAA Earth System Research Laboratory (ESRL) Global Monitoring Division in Boulder, CO, which also analyzes samples from the NOAA/ESRL Global Greenhouse Gas Reference Network. The measurements included in this data set are crucial for understanding changes in Arctic carbon cycling and the potential threats posed by thawing of Arctic permafrost. There are 4 data files in netCDF (*.nc) format, one for each year of samples collected at the CARVE tower, with this data set. All data are stored in NetCDF (*.nc) version 4 file format. Each file provides measurements of dry mole fractions of atmospheric CO2, CH4, CO, H2, N2O, and SF6 and other trace gases acquired over one year of measurements. Each file contains 14 geolocation variables and 69 science measurement variables described in (Table 2). The netcdf files also include a QC flag for each analyte. For example, the benzene ratio QC flag is “benz_ratio_status”. The flag values are the same for all analytes and are provided in Table 3. These data files contain dry mole fractions of CO, CO2, CH4, H2, N2O, and SF6 measured from whole air samples collected at the CARVE tower site between 2012 and 2015. These measurements provide context for aircraft observations obtained during the CARVE project. The CARVE project was designed to collect detailed measurements of important greenhouse gases on local to regional scales in the Alaskan arctic and demonstrate new remote sensing and improved modeling capabilities to quantify Arctic carbon fluxes and carbon cycle-climate processes. The CARVE data provide insights into Arctic carbon cycling that may be useful in numerous applications. Table 4. Repeatability of gas detection was determined as 1 standard deviation of ~20 aliquots of natural air measured from a standard cylinder. A stationary, tower-based greenhouse gas measurement site, the CARVE tower (NOAA site code CRV), was established in 2011 to give year-round context for the intensive aircraft observations performed throughout the CARVE project. The measurements contained in this data set are from the flask sampling system at the top (32 m.a.g.l.) of CARVE tower in Fox, Alaska (17 km north of Fairbanks; 64.9863 N, 147.5982 W, 611 m.a.s.l.). The tower site was chosen for its high elevation compared to the immediate surrounding mean ground level and its relatively large region of influence to provide temporal and spatial context for CARVE aircraft measurements in interior Alaska. The surrounding land cover is composed of deciduous and evergreen forest, shrub or scrub, some scattered areas of woody wetlands, mainly south of the Chena River south of Fairbanks, and medium and low intensity developed land in and immediately around Fairbanks (Homer et al., 2015). The tower is located on a ridge, and measurements from the tower represent a wide region of interior Alaska, as indicated by surface influence fields generated from the WRF-STILT modeling framework (Henderson et al., 2015), which show that the tower’s influence region encompasses a substantial part of Alaska (Fig. 1a). This data set includes measurements from discrete air samples captured by the flask sampling system atop the CARVE tower. The two air-sampling devices, the Programmable Flask Package (PFP) and Programmable Compressor Package (PCP) systems, are used routinely on aircraft as part of the NOAA/ESRL Global Monitoring Division’s Global Greenhouse Gas Reference Network (Sweeney et al., 2013). A typical sampling routine uses one PCP and one or more PFP(s) that are pre-programmed with a sampling plan dictating the interval for filling each flask. For each sample, the inlet line and compression manifold are flushed with about 5 liters of ambient air. Valves on both ends of the current flask are then opened and the flask is flushed with about 10 more liters of ambient air to displace the dry, low CO2 fill gas with which the flasks are shipped. The sample flush air is measured by a mass flow meter to ensure that a sufficient volume passes through the manifold and flask before the downstream valve is closed and pressurization begins. Sample flush volumes and fill pressures during sampling are recorded by the data logger, along with ambient temperature, pressure, and relative humidity. GPS position and time stamp are also recorded with each sample. Quantities of CO2 in flask air samples were detected using a non-dispersive infrared analyzer and reported in parts per million (micromol CO2 per mol dry air, i.e. ppm). Because detector response is non-linear in the range of atmospheric levels, ambient samples are bracketed during analysis by a set of reference standards used to calibrate detector response. CH4 was isolated from constituent gases through gas chromatography and quantified with flame ionization detection. Measurements are reported in parts per billion (ppb). CO was determined by either resonance fluorescence at ~150 nm with a precision of ±0.4 ppb, or by UV absorption spectroscopy with precision ~1 ppb (Novelli et al., 1998) and reported in ppb. H2 was isolated using gas chromatography, and detected using pulsed-discharge He ionization, providing a precision of ±0.4 ppb for H2 (Novelli et al., 2009). H2 quantities are reported in ppb. The N2O and SF6 sample components were isolated using gas chromatography and quantified with electron capture detection. N2O and SF6 are reported in ppb and parts per trillion (ppt), respectively. Conway, T.J., et al. (1994), Evidence for interannual variability of the carbon cycle from the National Oceanic and Atmospheric Administration/Climate Monitoring and Diagnostics Laboratory Global Air Sampling Network, J. Geophys. Res., 99, 22,831–22,855. Dlugokencky, E.J., L.P. Steele, P.M. Lang, K.A. Masarie (1994), The growth rate and distribution of atmospheric methane, J. Geophys. Res., 99, 17,021–17,043. Dlugokencky, E. J., et al. (2009), Observational constraints on recent increases in the atmospheric CH4 burden, Geophys. Res. Lett., 36, L18803, doi:10.1029/2009GL039780. Gerbig, C., S. Schmitgen, D. Kley, A. Volz-Thomas, K. Dewey, D. Haaks (1999), An improved fast-response vacuum-UV resonance fluorescence CO instrument, J. Geophys. Res. 104, 1699 –1704. Henderson, J.M., J. Eluszkiewicz, M.E. Mountain, T. Nehrkorn, R.Y.-W. Chang, A. Karion, J.B. Miller, C. Sweeney, N. Steiner, S.C. Wofsy, and C.E. Miller (2015). Atmospheric transport simulations in support of the Carbon in Arctic Reservoirs Vulnerability Experiment (CARVE), Atmos. Chem. Phys., 15, 4093-4116, doi:10.5194/acp-15-4093-2015. Homer, C.G., J.A. Dewitz, L. Yang, S. Jin, P. Danielson, G. Xian, J. Coulston, N.D. Herold, J.D. Wickham, and K. Megown (2015). Completion of the 2011 National Land Cover Database for the conterminous United States-Representing a decade of land cover change information, Photogramm. Eng. Rem. S., 81, 345-354. Karion, A., C. Sweeney, J.B. Miller, A.E. Andrews, R. Commane, S. Dinardo, J.M. Henderson, J. Lindaas, J.C. Lin, K.A. Luus, T. Newberger, P. Tans, S.C. Wofsy, S. Wolter, and C.E. Miller (2016). Investigating Alaskan methane and carbon dioxide fluxes using measurements from the CARVE tower, Atmos. Chem. Phys., 16, 5383-5398, doi:10.5194/acp-16-5383-2016. Novelli, P. C., Elkins, J. W., and Steele, L. P. (1991). 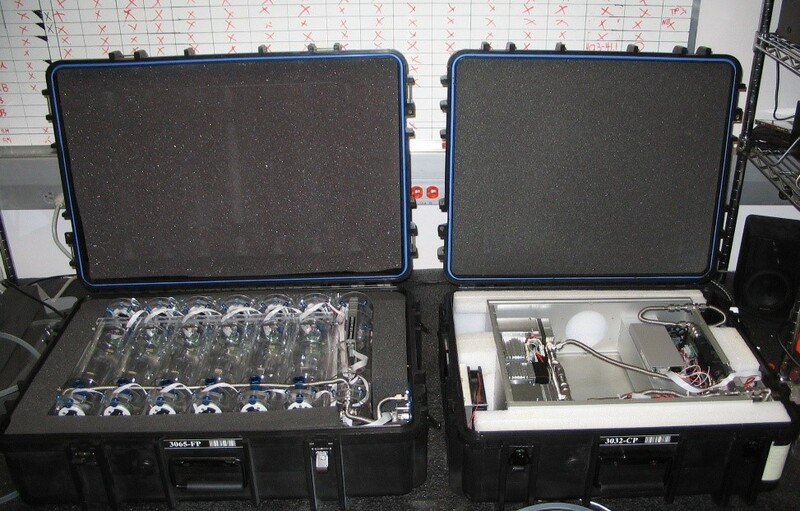 The development and evaluation of a gravimetric reference scale for measurements of atmospheric carbon monoxide, J. Geophys. Res.-Atmos., 96, 13109–13121, doi:10.1029/91jd01108. Novelli, P.C., P.M. Lang, K.A. Masarie, D.F. Hurst, R. Myers, J.W. Elkins (1999), Molecular hydrogen in the troposphere: Global distribution and budget, J. Geophys. Res. 104, 30,427-30,444.